Morgan Stanley (MS) is expected to report sharp declines in third-quarter earnings and revenue ahead of Wednesday's opening bell, hurt by months of weak trading activity in a market low on volume. Morgan Stanley is forecast to post earnings of 15 cents a share, according to data from Thomson Reuters, less than half the 38 cents a share booked in last year's third quarter. Revenue, on average, is expected to drop to $6.44 billion from $8.68 billion a year ago. Rival Goldman Sachs (GS) reported sharp declines in third-quarter earnings and revenue Tuesday, due to slower trading activity over the summer, but its profits still easily exceeded analysts' average forecast. 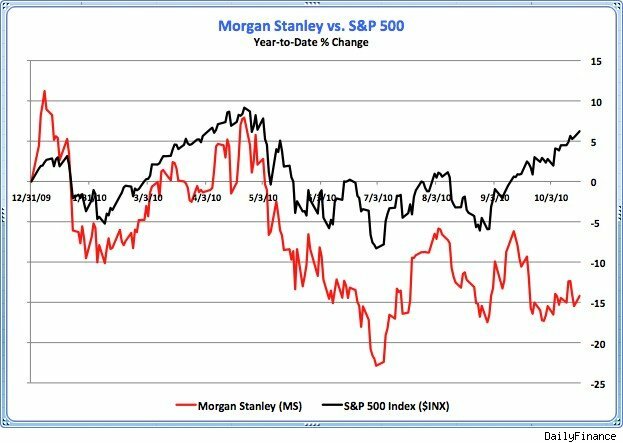 Investors will be looking for similar results at Morgan Stanley. "Despite the rally in equity and fixed income markets over the course of [the third quarter], it was a difficult quarter for Goldman Sachs and Morgan Stanley as investor activity levels, trading flow and transaction volumes, as well as volatility across most businesses were muted or weak throughout," Keefe Bruyette & Woods analyst Robert Lee wrote in a note to clients ahead of the report. Financial sector earnings season has been mixed so far, with revenue weakness stealing the spotlight from mostly better-than-expected bottom-line results. Dow component Bank of America (BAC), the nation's largest bank by assets, missed Street revenue estimates Tuesday. Citigroup (C) on Oct. 18 posted third-quarter revenue that was short of Street estimates, due in part to lower revenue from its Securities and Banking division. Dow component JPMorgan Chase (JPM) last week reported disappointing third-quarter revenue, partly traceable to a decline in revenues from underwriting stocks, bonds and advising on deals. 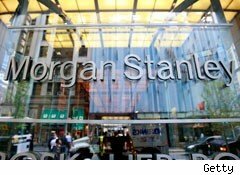 Shares in Morgan Stanley are off about 12% for the year to date, underperforming the broader market by a wide margin. See the chart below.